Robert Herrick: To His Mistress. None then will woo ye. 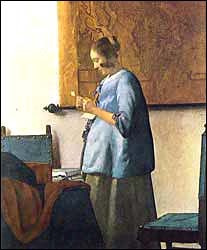 Jan Vermeer. Woman in Blue. London, Lawrence & Bullen, 1891. 36-7. Created by Anniina Jokinen on October 19, 1998. Last updated on February 9, 2001.